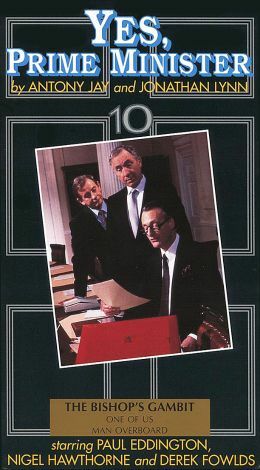 This home video release features three episodes from the sequel to the popular British situation comedy Yes, Minister, following the political misadventures of James Hacker (Paul Eddington) after he rises from Minister for Administrative Affairs to Prime Minister of Parliament; of course, his old partners (and sometimes rivals) Sir Humphrey Appleby (Nigel Hawthorne) and Bernard Woolley (Derek Fowlds) are still on hand to wave comedic verbal battle with Hacker. In "The Bishop's Gambit," it falls to Hacker to choose a new bishop, but he isn't especially happy with his choices -- or Appleby's suggestions. Hacker discovers Appleby helped to pardon a Russian espionage agent years ago in "One of Us," leading to a small outburst of controversy -- and a hilarious attempt by Appleby to clear his name. And in "Man Overboard," the Minister of Employment looks to Hacker to help him scuttle a plan to move military bases from Southern England to the North; however, Appleby insists on running interference against the plan.